What is Media Literacy? Why is media literacy important? These questions help you understand the importance of teaching about media literacy. Why should you question media messages instead of simply accepting them as truths? Why should we adopt a ?skeptic? attitude regarding social media news? How can we identify biases in news stories? Why should we identify biases? What techniques are used to get you to share a news feed? Why should you exercise caution before sharing a news story? Why is it important to look at the sources of news in the media? What are the most reliable sources of news? Why did you select these sources? Why do some news stories go viral? Do you think most viral stories are true or not true? Why? How do you define fake news? What would you define ?News? as? Why should you always think about the impact of sharing a news report prior to sharing it? Explain the following: The media constructs the message, the reader constructs the meaning. What five things can you do to determine the legitimacy of a news story? Why is it important to discern fact from fiction? Why is it important to determine biases in news? Explain this statement ?The News isn?t What it Used to Be? Brainstorm the impact of biases and opinions in the news. 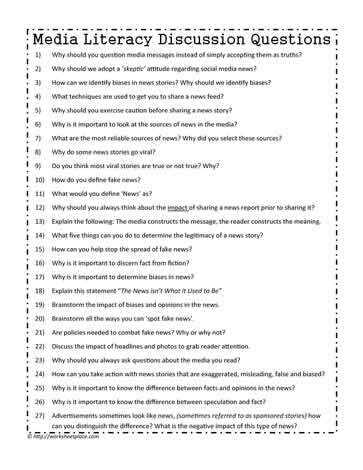 Brainstorm all the ways you can ?spot fake news?. Are policies needed to combat fake news? Why or why not? Discuss the impact of headlines and photos to grab reader attention. Why should you always ask questions about the media you read? How can you take action with news stories that are exaggerated, misleading, false and biased? Why is it important to know the difference between facts and opinions in the news? Why is it important to know the difference between speculation and fact? Advertisements sometimes look like news, (sometimes referred to as sponsored stories) how can you distinguish the difference? What is the negative impact of this type of news?